Are you looking for Certificate of Formation Apostille service in the United States? Do you want to open a bank account for your US Corporation overseas? Then, you will need to Apostille your Certificate of Formation (Articles of Organization Apostille) for use in the Hague Convention Apostille Countries, or to obtain Embassy Legalization if you are going to use your Certificate of Formation in a Non-Hague Country. 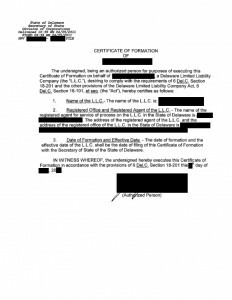 What is the definition of Certificate of Formation? The entity name- ending with LLC. The chosen Place of the business entity. The Business Entity managers “Members”. Articles of Organization is used in Alabama, Alaska, Arizona, Arkansas, California, Colorado, Connecticut, Washington DC, Florida, Georgia, Hawaii, Idaho, Illinois, Indiana, Kansas, Kentucky, Louisiana, Maine, Maryland, Massachusetts, Michigan, Minnesota, Missouri, Montana, Nebraska, Nevada, New Mexico, New York, North Carolina, North Dakota, Ohio, Oregon, Oklahoma, Rhode Island, Pennsylvania, South Carolina, South Dakota, Tennessee, Utah, Virginia, West Virginia, Wisconsin and Wyoming. Certificate of Formation is used in Delaware, Mississippi, New Hampshire, New Jersey, Texas and Washington. Certificate of Organization is used in Iowa. DC Apostille. offers expedited Apostille service for Certificate of Formation for use in any of the Hague convention apostille countries. We will obtain Certificate of Formation Apostille from the Secretary of State Office in the Same State that issued the Certificate of Formation. If you want to use your Certificate of Formation in a Non-Hague County, then you will need to legalize your documents from the Embassy of the destination country in Washington DC.